When I got home I checked to see if my ancient Realistic PRO-38 scanner was capable of tuning the North American APRS frequency (144.390 MHz). It could! Now I had to find a way to decode the data from the analog audio output of the scanner. Fortunately several software projects exist that are capable of this. 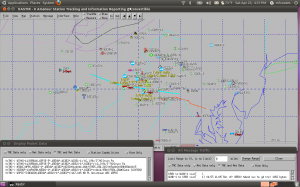 I used Soundmodem since it was available in Ubuntu’s repository. Configuring soundmodem was fairly straightforward, and after cobbling together the audio connection I could see APRS data! 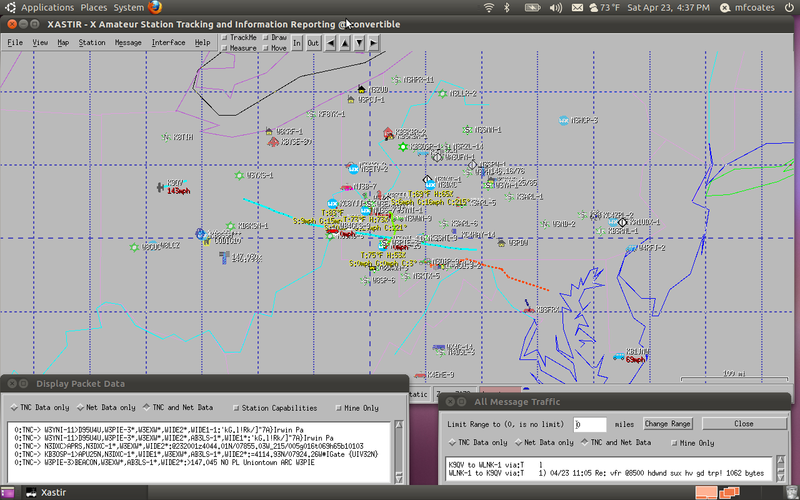 Add some APRS mapping software on top (Xastir), and you have a decent graphical APRS system. The scanner an old, basic analog UHF/VHF receiver. I got it as a freebie from a garage sale. 🙂 The scanner tunes to your local APRS frequency. You connect the computer to the scanner with a simple mono-to-stereo audio connection. I used the earphone out, and the line-in on my laptop. Be careful that the volume is turned down as low as possible on the scanner, you don’t want to ruin the sound card on your computer. The cable in the middle, with the big cylinder on it, is a 1:1 ground-loop isolation transformer. This was used to eliminate the chance of ground-loop current generating noise, or worse, damaging the equipment. If you will be making this setup permanent, you may want to look into proper impedance matching between your scanner/radio output and your computer. Set up the capture source on your computer, make sure it doesn’t sound distorted, and you should be ready to set up your software. Soundmodem will do the heavy lifting of decoding the audio and making it available to Xastir. Xastir is optional I suppose, but it’s nice to see the data plotted on a map. A simple mono-to-stereo connection is needed. I used a 1:1 isolation transformer to eliminate the chance of ground loop current. This is one of a few projects that were a result of my realization that you can listen to more than emergency responders with a scanner. If you have one, I suggest dusting it off and breathing new life into it. 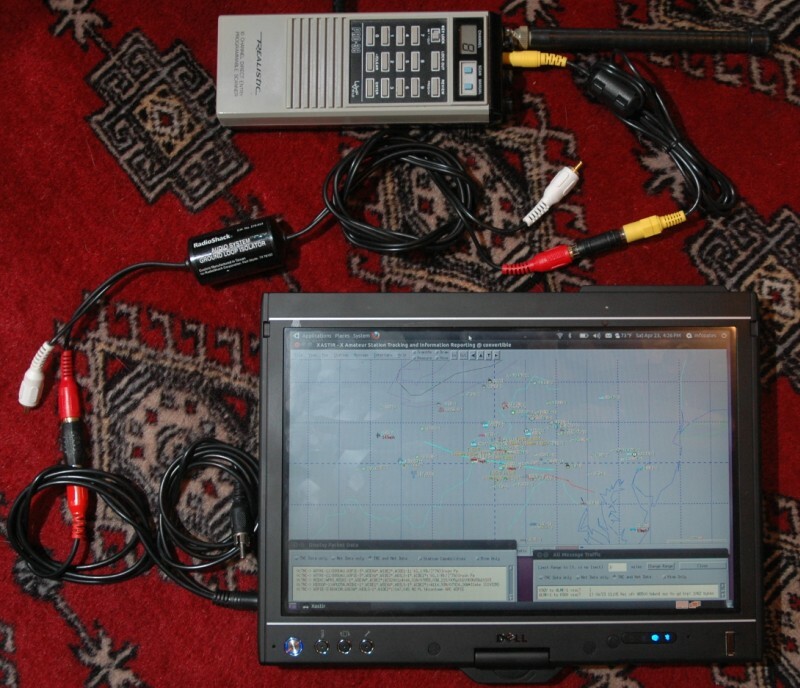 You can listen to amateur radio repeaters, APRS data, and even the space station! I’ll be using it this weekend down in Florida to hear the retransmitted audio of the shuttle (STS-134) launch! What a great thing to have around!